There are so many apps on the market that can protect you from expensive fines, no one should really speed but now and then some forget what speed they are doing and the traps catch you out. If you live in Germany you may want to try out the Blitzer app. The Blitzer.de app for Android gives users an early warning of speed traps, Phones Review always suggests you abide by the law and stick to the seed limits. Some Android users in Germany may have slipped into the bad area of the Flensburg point’s account, so maybe you need all the help you can get. 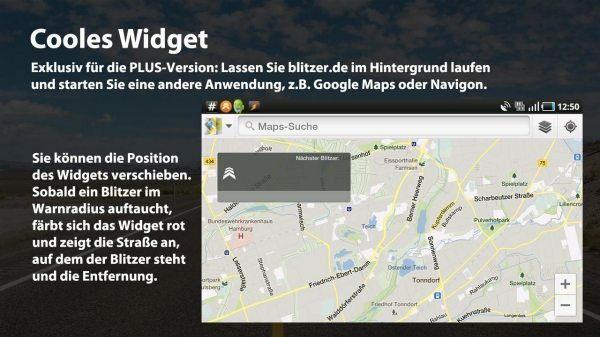 Once you have installed the Blitzer app those is Deutschland will hear audible warning tones, this alerts the users of upcoming radar, speed traps etc. The app gets all its information via ones of Germany’s largest databases of speed cameras, main features of the app includes: receive mobile speedcam alerts in real time, landscape mode, over 47,000 fixed speedcams worldwide from SCDB.info, directional alerts for all fixed speed cams, automatic updates every 5 minutes, online/offline mode and so much more. You can install the free version of Blitzer.de app via Google Play, you can but the paid version for £4.24 called Blitzer.de PLUS. Please do stick to the speed limits, this application does not mean you should purposely go out and drive fast. Please drive safe and live longer.